With over 40 years experience as a finance professional, Nancy joined Spectrum in 2012 as an Executive Vice President. Her responsibilities include financial planning, investment counseling and working with clients to safeguard their financial future. 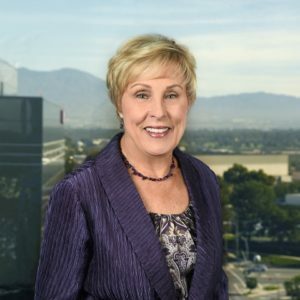 Prior to merging her firm with Spectrum, Nancy co-founded the registered investment advisory firm of Harrigan & Howard Financial Advisors in 1997. Before founding Harrigan & Howard, she worked as a credentialed CFP® with a regional financial planning firm. Nancy entered the advisory business to help people with planning for and maintaining their financial independence. She began her financial career as a Certified Public Accountant with a large national public accounting firm in Los Angeles. After several years, Nancy expanded her financial expertise by transitioning to the corporate world where she held positions as a Controller, Vice President of Finance and Chief Financial Officer of both private and publically held companies. Some of her interests include snow & water skiing, travel, hiking and tennis. Born in Wisconsin, Nancy grew up in Southern California and currently resides with her husband in Huntington Beach.